An autumn chill has settled over Busman's Harbor, Maine, but Julia Snowden is warming up the town by offering lobster stew at the local diner. When her landlord discovers a dead body in the walk-in refrigerator, Julia must figure out who ordered up a side of murder. This was my first introduction to Barbara Ross, even though I have Clammed Up sitting in my to-be read pile. Since this is the first book in the series I've read, I appreciated the details and bits and pieces of back story thrown in from the other three books, it helped to keep the story cohesive and it helped me to "meet" the characters and town faster and get immersed in their world. The plot itself is well written and well developed, however I had to pay close attention through most of the book because of the list of supporting characters in this story. I admit I had to stop a few times throughout the story and realign my characters because I was confused. With that said though, the characters are well-rounded and well-written, making this story a fun and engrossing read. I really felt like I watched Julia grow throughout the story. Without giving away any details, I saw her mature and I felt her relationship with Chris grow deeper too. I can't wait to see where their relationship goes in the future. I really liked reading their scenes together. I loved all of the twists and turns that the book took, leading to a surprise finish, which I completely enjoyed. I love coming to the end of a cozy and really feeling wowed, like I never saw that coming. I was also so happy to find all of the recipes in the back of the book, as while I was reading about them I was practically drooling onto my phone. I can't wait to try out the split pea soup and the lobster corn chowder. 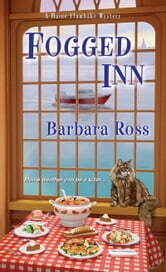 Overall, Fogged Inn was a fun read with great writing enhanced by an enjoyable and suspenseful mystery and great characters! I received an ARC of this book, from NetGalley, in exchange for my honest review. A steady plot with an easy to follow investigation that included some surprises. Recipes of meals offered at Gus Too are in the back of the book and look quite tasty. Julia Durand lives above Gus' breakfast & lunch diner in Busman’s Harbor, Maine. Julia and boyfriend, Chris, offer dinner service five nights in week during the off season. The discovery of a body in the walk-in freezer one morning has her investigative juices flowing. Linking 4 older couples, all using sequential coupon offers, dining the night before, the now dead man who was also dining that night, and a missing driver involved in a collision on that foggy night has Julia interfering with the police investigation and putting herself and Chris at risk. The author did a give clues to the help with figuring out all the relationships joining this series at book 4, so reading book 1 - 3 would be helpful but not a necessity. I received an advance copy of this book through Net Galley in return for an honest review. Enjoyed this book. It had more depth and dimensions than the Cozy Mysteries I am used to reading, an interesting and we'll told plot, and real characters. There was good insightful writing. 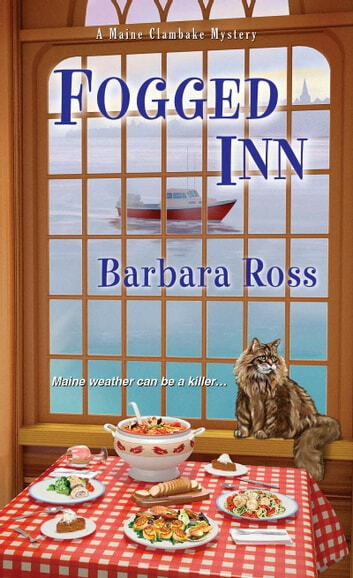 Fogged Inn by Barbara Ross is the fourth book in A Maine Clambake Mystery series. Julia Snowden is running a restaurant with her boyfriend, Chris Durand during the off season in Busman’s Harbor, Maine. They serve only dinner and are running it at Gus’s (and call it Gus’s Too). The morning after a long night Gus Farnham (the landlord) yells up the staircase about a dead stiff in the walk-in freezer (Julia lives in the apartment above the restaurant). Julia hurries down the stairs and there is a dead main in the freezer. They immediately call the police. Julia wonders how the man got into the building (and scared that a killer was in the building while she was asleep). The dead man was in the restaurant the night before sitting at the bar. Julia remembers him leaving. No one, though, seems to know his name. Who is the man and why is he dead (and placed in the freezer)? Julia sets out to find the killer (because she is curious and bored). Fogged Inn was not my favorite book in the series. I did not find it good as the previous three books in the series. There are quite a few questioning sessions (where Julia is questioning her list of suspect. Though I do find it hard to believe that these people would talk to her willingly). The mystery was complex (which I liked), but I did not like how Julia went about her investigation. She was running around town like a chicken with her head cut off and jumping to the wrong conclusions. I give Fogged Inn 3 out of 5 stars. Something was just missing this time around. I also found the ending to be a bit of a letdown. Fogged Inn can be read alone, but I think readers would find it helpful to read the other books in the series. I received a complimentary copy of Fogged Inn from NetGalley in exchange for an honest review.